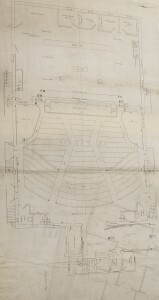 A picture of one of the original plans for the interior of Smith’s Opera House, as designed by Pierce and Bickford. These plans were rejected by William Smith in favor of those created by Leon H. Lempert (Pierce and Bickford Architects). With a plot of land secured and enough money raised in the spring of 1893, William Smith needed a design for the opera house that he and Geneva so desperately desired. Two major designs were put forth. 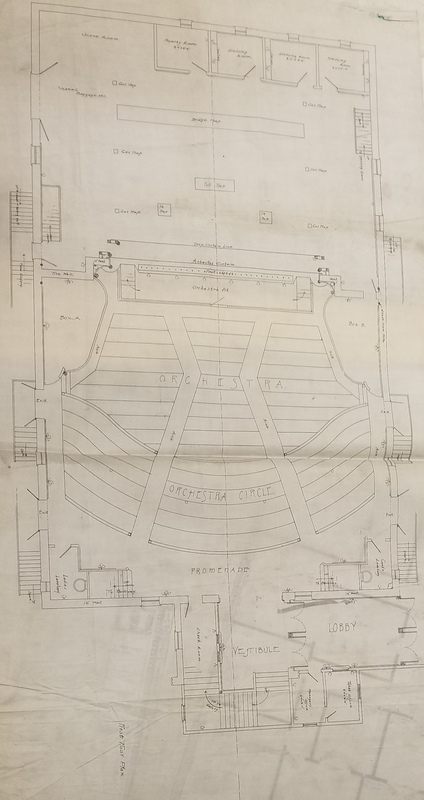 Architects Pierce and Bickford from Elmira, New York drew up plans for both the interior and exterior of the opera house, and Leon H. Lempert from Rochester, New York drew up plans for his own design of the interior. Smith decided to use Lempert’s design (Crawford and Stearns 13-14), leaving Pierce and Bickford with an entire, unused interior design for the theatre. Thankfully they kept those original plans, and now they can be seen in Cornell University’s Division of Rare and Manuscript Collections. The drawings are mesmerizing to look at, since one can only imagine the grandeur of their design that never came to be. Not all was lost for Pierce and Bickford, however, since Smith decided to use their exterior designs (McNally 17). This was no small consolation prize, as this included the office building in front of the theatre. For more details on that layout, please refer to the past Smith History Blog titled, “Two Buildings Into One: Opera House and Office Buildings as Separate Entities.” This resulted in a combination of Lempert’s interior design and Pierce and Bickford’s exterior design in the final construction of the opera house. Seating about 1,200 people and decorated in a Louis XVI style, Lempert’s design quickly became the pride of Geneva once it was unveiled on October 29, 1894. The finished interior aligned with narly all of Lempert’s plans, except for a moving floor that he had wanted to install. Intended to create more stage space for big events and gatherings, this moving floor was deemed too costly by William Smith and so it was scrapped (Crawford and Stearns 19-21). 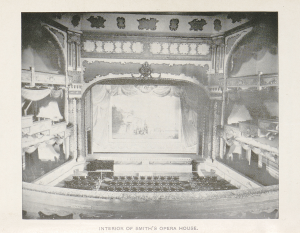 Otherwise, the “extravagant” and “elegant” (McNally 18) interior of Smith’s Opera House was as Lempert intended. Its coloring was reportedly “subdued” and predominately made use of salmon and terracotta colors (Crawford and Stearns 20). In retrospect, those colors must have matched quite nicely with Pierce and Bickford’s design for the facade of the building, which of course still stands today. 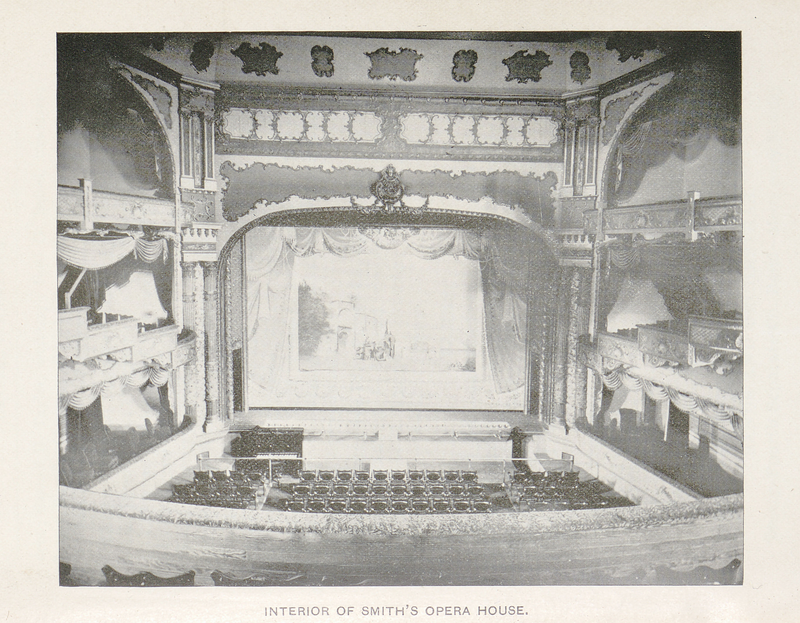 A picture of the original interior of Smith’s Opera House, as designed by Leon H. Lempert. In stark contrast to the survival of the 1894 facade of the Smith, Leon H. Lempert’s interior was completely demolished with the renovations introduced to the building by Schine Enterprises, completed in 1931. Even though written descriptions and some pictures still survive today, the design feels almost as mythical as the rejected Pierce and Bickford interior design. It’s unfortunate that none of us can walk through and experience either of those late 19th Century designs. Then again, maybe we all should be thankful for our brilliant starry sky as opposed to the original salmon ceiling (“New Opera House”). Crawford and Stearns Architects and Preservation Planners. “Historic Structure Report: Smith Opera House.” Syracuse NY, Jan 1990. McNally, Charles. The Revels in Hand: The First Century of the Smith Opera House October 1894-October 1994. Finger Lakes Regional Arts Council, 1995. “New Opera House.” Geneva Daily Gazette, 28 Sept 1894. Rochester Regional Library Council. NYS Historic Newspapers.